MARINA is the only stand-alone novel written by Zafón, so far. If I am to guess, this novel is a nod to Mary Shelly’s Frankenstein. Followers of Zafón’s works will also discern immediately that this novel set the bridge for his renowned trilogy, The Cemetery of Forgotten Books. The similarities are not only with the setting but with the plot and personalities of each character. 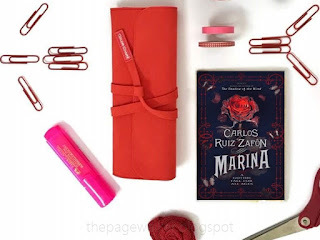 The premise was set in haunted Barcelona and told from an endearing character that readers will have no difficulty attaching themselves to. The plot is both dark and good; two love stories set in different time frames that will inevitably merge together, to be painted in gloom and pain. That must have sounded redundant, but that's what I did expect from a Zafón novel. "Artists live in the future or in the past, rarely in the present." The story was told by a young man living in a boarding school, away from parents who, of course, doesn't want to be bothered with the rudiments of raising a child. On one of his aimless roaming of Barcelona, he found himself in a predicament that only friendship can straighten. A friendship marked for a lifetime. "Sometimes the things that are most real only happen in one’s imagination. We only remember what never really happened. " The other thing, and I guess the most important reason, I've always enjoyed Zafón is because of the language. Such descriptive eloquence is simply divine and magical, even though the topic was both Gothic and gory. Inasmuch as I give Zafón praises for that, I believe some credit must go to Lucia Graves for doing a marvelous translation, not only with Marina but to all of Zafon’s work. This book is the last in my Zafón collection. I hope he writes soon because I don’t want to miss him too long.